Unusual Art Deco 'Inverted Pyramid' Silver Bracelet [SH10182] - £175.00 : loveVintageDiamonds.com, Your Vintage Diamond Dreams Come True! 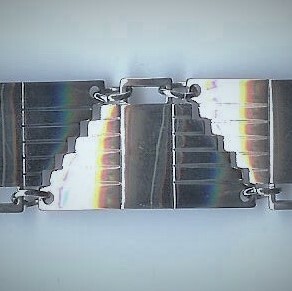 Unusual Art Deco 'Inverted Pyramid' Silver Bracelet. 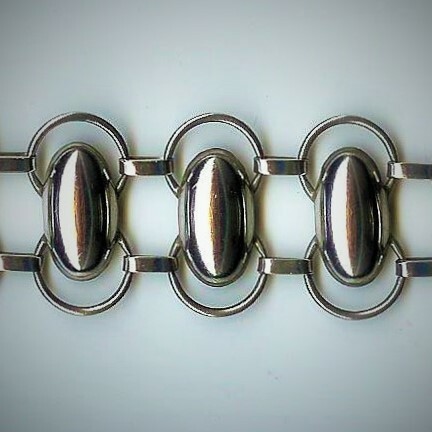 This bracelet is yet another example of why the Art Deco period was perhaps the most fabulous of them all! It's geometric design, with its inverted pyramid links, and straight lines, is very appealing to the senses and both looks and feels great. It is stamped '925' to indicate that it is sterling silver. It measures approximately 7.25" in length, when fastened, and 11/16ths of an inch in width. This bracelet weighs approximately 23.5gms.